Obviously, this cocktail is more seasonally suited for the summer. But I bought some basil to make a pasta dish and had some leftover, and was inspired to find a basil cocktail this week. 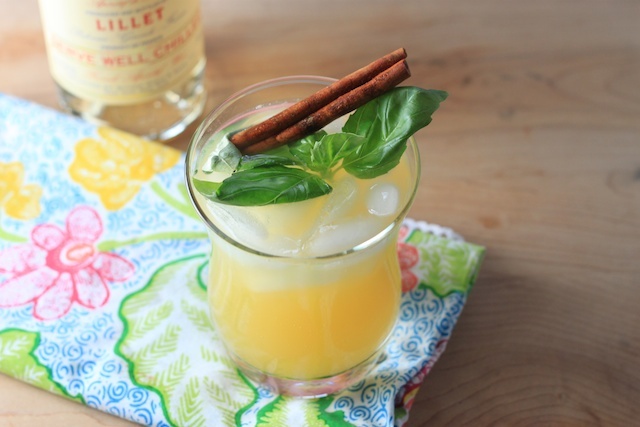 This recipe is from Martha Stewart and is an incredibly refreshing and light cocktail that is perfect for a brunch drink. It was great on a rainy March afternoon and will be even better this summer. 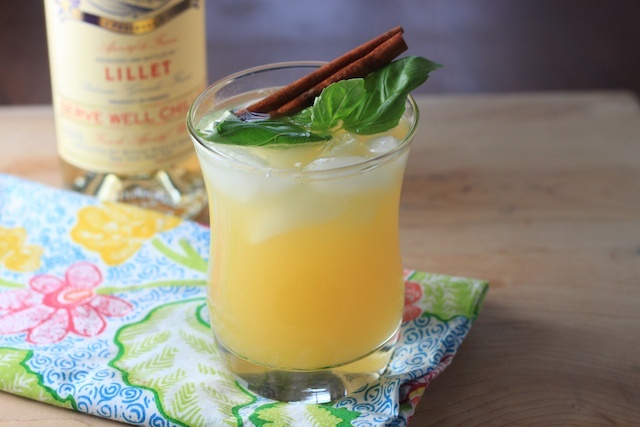 Lillet is a French aperitif wine that is a blend of french white wine and macerated citrus liqueurs (mostly from orange peels). Sounds delish, right? It is. This was my first experience with Lillet and I definitely will be drinking more of it just over ice. It blended very well with the green taste of the basil. Martha recommends garnishing this with both a cucumber spear and a cinnamon stick. I just went with the cinnamon stick, and to be honest it seemed to be more decorative than anything else. The recipe for this yummy cocktail after the jump. Directions: Combine everything but the soda water and garnishes in a cocktail shaker. Press down the basil leaves with a spoon to release the flavor. Shake vigorously and pour into a glass with a handful of ice. Top off with the soda water and add garnishes. Sip leisurely and enjoy. I love Lillet! Definitely making this when my new basil plant yields enough. This looks delicious. I am a huge fan of Lilet. Try it simply on the rocks with a large slice of orange. Sooo good! Hi Wendy, We've selected you as our Foodista Drinkblog of the Day this March 19, 2012!This post will be featured on the Foodista homepage for 24 hours,together with a thumbnail sized image and description of the post.We wont post any of your recipes,it will be a clickable link so the readers will go directly to you for recipes. Since you are now a part of the Foodista Featured Drink Blogger of The Day Community, we've created a special badge for you to display on your blog sidebar. I couldn't find your email on your blog to send you the access code for the special badge, but I want to make sure you get it if you are interested. Please send me an email and I'll send it right away. Thanks! Have a great weekend!